My birthday was earlier this month and one of my favorite things about birthdays is all the birthday freebies that I can get just for signing up. Of of my favorite birthday freebies is from World Market Explorer. I love World Market. They have such a fun variety of items. I signed up for World Market Explorer and for my birthday I received a $10 off a $10 or more purchase coupon in my email. You know what that means? Free stuff! I got the coupon a couple of weeks ago and today was the last day to use it, so I stopped in on the way home from church and picked up a few things. We were out of coffee so I got some of their coffee and also some chips and salsa (because I was hungry). I ended up paying only $3.27 after the coupon! I think that I found my new favorite salsa-roasted tomato-yummy! This bag of chips was pretty much empty by the end of lunch today. There are some other perks to being a World Market Explorer member like a free bag of coffee coupon when you have bought 6 bags and 10% off purchase coupons. I found another fun birthday freebie this year, too. 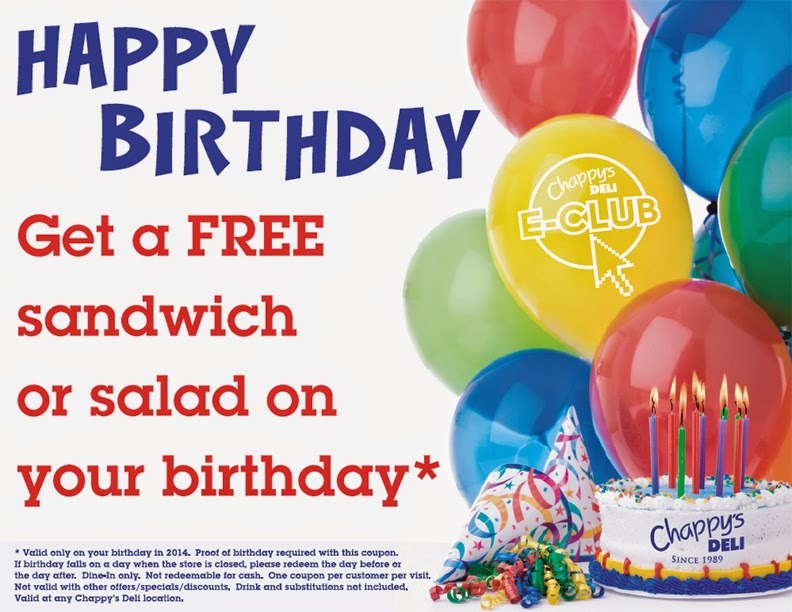 If you join Chappy's Deli E-club, you get a coupon for a free sandwich or salad on your birthday. Unfortunately for me, I forgot about the club and I am notorious for not checking my email regularly so I didn't see the email until after my birthday and this coupon has to be redeemed on your actual birthday. :( Next year I will definitely plan to take myself out for lunch on my birthday to Chappy's Deli. I did manage to get a free Chicken Nibbler sandwich from Zaxby's by signing up for their Zax Mail Club. It was a nice little snack while I was out running errands the other day with the babies. There are other birthday freebies but this is just a few of my favorites. I will try to do a post later with even more birthday freebies to sign up for. Do you know of any birthday freebies? What are your favorites? Are you feeling HOT, HOT, HOT?? It's gonna be rather warm around here this weekend. Drink lots of water and stay cool. Are you gonna be getting out or staying in a staying cool? Here are some events that are coming up this week around the river region.